You are currently viewing Archived reports for the week of 4 October-10 October 2017. 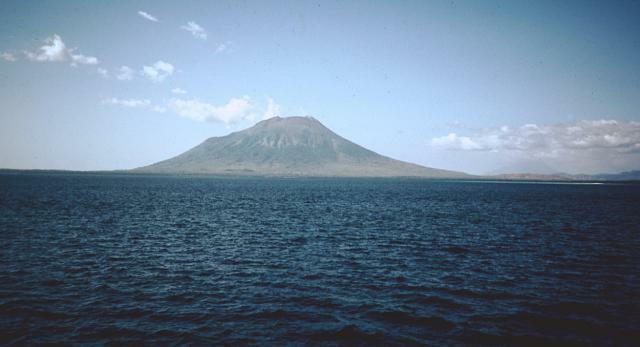 The number of shallow and deep volcanic earthquakes at Lewotolo recently increased, prompting PVMBG to raise the Alert Level from 1 to 2 (on a scale of 1-4) on 7 October. 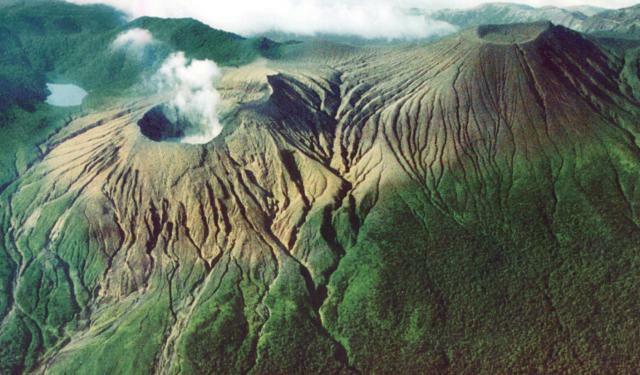 The report noted that the public should not enter the 2-km-radius exclusion zone around the crater. Solfatara emissions rose as high as 500 m above the crater rim on 9 October; emissions during 1 August-6 October rose 50-600 m. BNPB reported that five earthquakes recorded by Badan Meteorologi, Klimatologi, dan Geofisika (BMKG) on 10 October ranged in magnitude between 3.9 and 4.9, and were located 10-30 km below Lewotolo. The events were felt by local populations, causing an evacuation of 723 people. Preliminary data suggested that five homes were damaged from rock avalanches, triggered by the earthquakes. 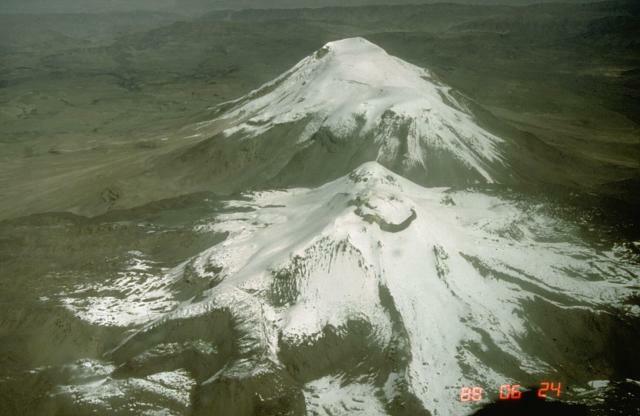 On 6 October KVERT reported that a thermal anomaly at Bezymianny was identified in satellite images during 1-2 and 4-5 October, and that lava probably continued to flow down the W flank of the dome. The Aviation Color Code was lowered to Yellow (the second lowest level on a four-color scale). 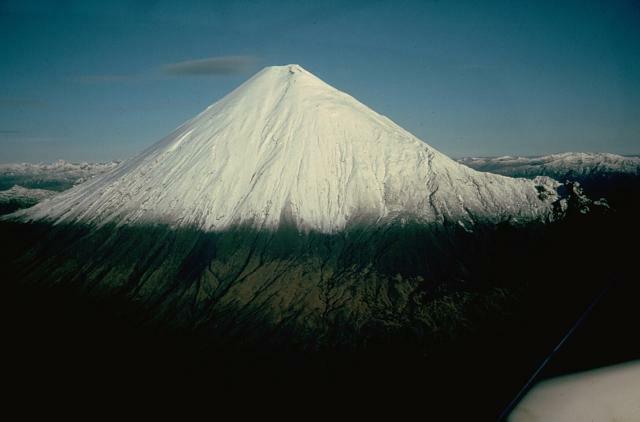 AVO reported that no significant activity at Cleveland was observed in seismic or infrasound data during 4-10 October, though elevated surface temperatures identified in satellite data on 6 October suggested that the lava dome in the summit crater (first noted on 30 September) continued to grow. Elevated surface temperatures were identified during 8-9 October. 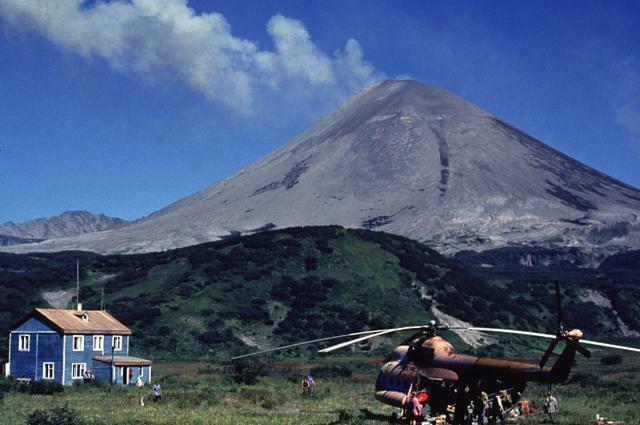 The Aviation Color Code remained at Orange and the Volcano Alert Level remained at Watch. Based on analyses of satellite imagery, model data, and notices from PVMBG, the Darwin VAAC reported that during 4-10 October ash plumes from Dukono rose to altitudes of 1.8-2.1 km (6,000-7,000 ft) a.s.l. and drifted N, NW, W, and SW. Ash plumes drifted 140-170 km on 8 October. 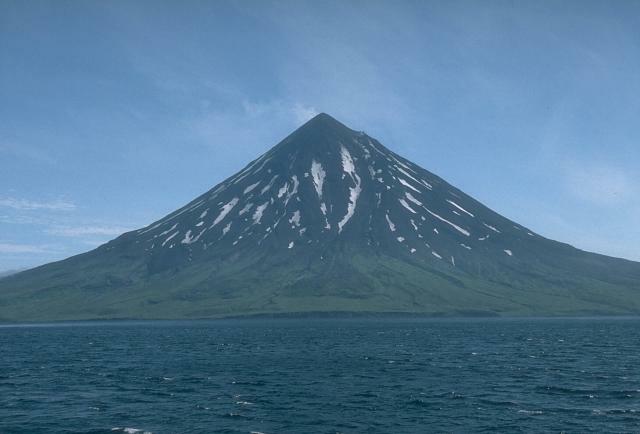 Based on observations by volcanologists in Severo-Kurilsk (Paramushir Island), about 7 km E of Ebeko, explosions during 29-30 September and 1 and 5 October generated ash plumes that rose 1.5 km (4,900 ft) a.s.l. The Aviation Color Code remained at Orange (the second highest level on a four-color scale). 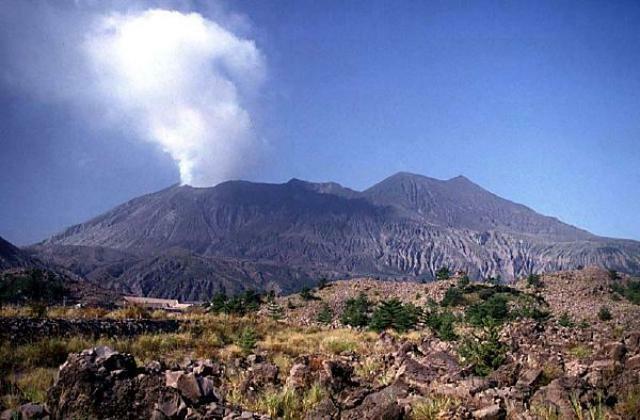 CONRED and INSIVUMEH reported that during 4-6 October increased explosive activity (8-12 explosions per hour) at Fuego generating ash plumes that rose as high as 1.3 km above the crater. Ash plumes drifted more than 20 km S, SW, and W; ashfall was reported in areas downwind including Panimaché I and II (8 km SW), Santa Sofía (12 km SW), Morelia (9 km SW), and El Porvenir. 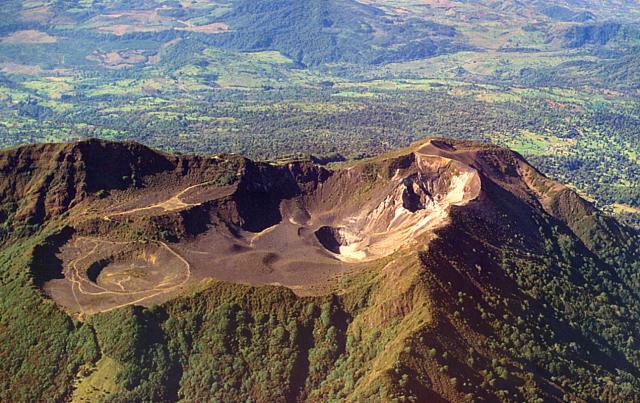 Incandescent material rose 300 m above the crater, and avalanches of material traveled as far as 1.5 km W down the Seca (Santa Teresa) ravine and SSW down the Ceniza ravine. Shockwaves vibrated local structures. An average of 4-6 explosions per hour were detected during 7-8 October. 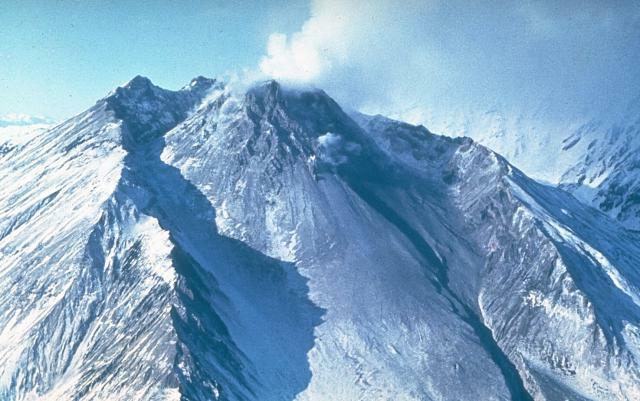 Ash plumes rose around 1 km and drifted 12 km W, NW, and N. Incandescent material was ejected 150 m above the crater, causing avalanches that were confined to the crater. Ash fell in local communities including San Pedro Yepocapa (8 km N), Sangre de Cristo (8 km WSW), and La Soledad. 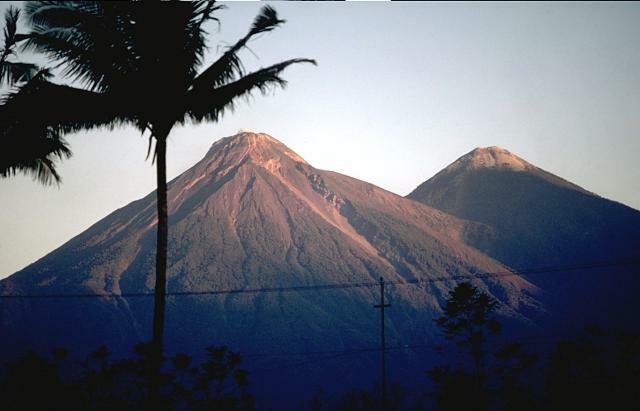 Vulcanian explosions during 8-9 October produced ash plumes that rose 1 km and drifted 15 km SW, W, and NW, again causing ashfall in Panimaché, Santa Sofía, Morelia, El Porvenir, San Pedro Yepocapa, and Sangre de Cristo. Block avalanches traveled 2 km down the flanks. KVERT reported that an ash cloud was identified in satellite images drifting about 85 km ENE from Karymsky on 3 October. The Aviation Color Code remained at Orange (the second highest level on a four-color scale). 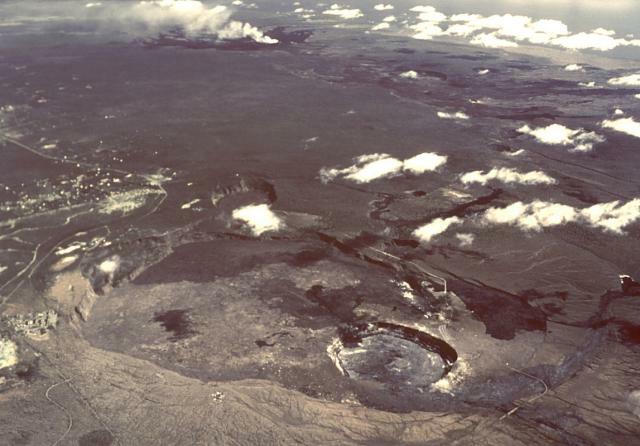 During 4-10 October HVO reported that the lava lake continued to rise, fall, and spatter in Kilauea’s Overlook crater. Webcams recorded incandescence from long-active sources within Pu'u 'O'o Crater and from a small lava pond in a pit on the W side of the crater. The 61G lava flow, originating from a vent on Pu'u 'O'o Crater's E flank, continued to enter the ocean at Kamokuna although the plume at the entry was weaker. Surface lava flows were active above and on the pali, and on the coastal plain. Based on analyses of satellite imagery and model data, the Darwin VAAC reported that on 4 October a minor ash emission from Langila rose 1.8 km (6,000 ft) a.s.l. and drifted N.
During 3-10 October IG reported a high level of seismic activity including explosions, long-period earthquakes, harmonic tremor, and signals indicating emissions at Reventador. 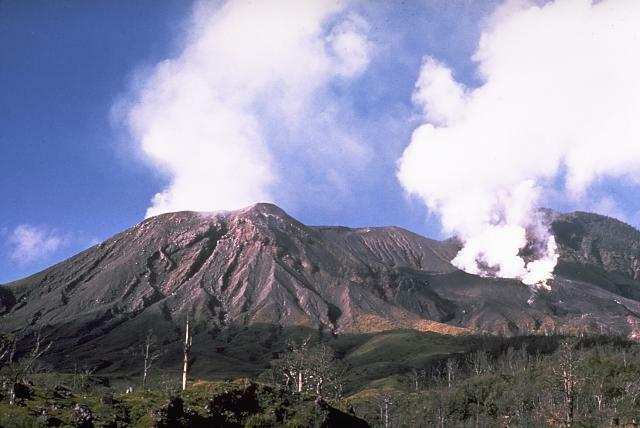 Steam, gas, and ash plumes rose sometimes higher that 1.1 km above the crater rim and drifted mainly NW, W, and SW. Incandescent blocks rolled as far as 800 m down the flanks. Weather clouds sometimes prevented visual observations. 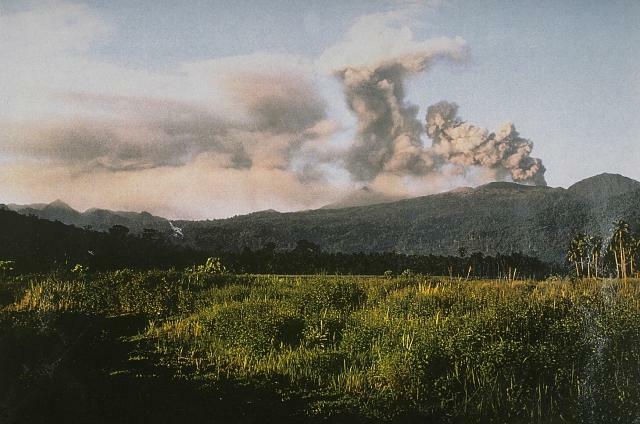 Observatorio Vulcanológico del Sur del IGP (OVS-IGP) and Observatorio Vulcanológico del INGEMMET (OVI) reported that explosive activity at Sabancaya slightly declined; there was an average of 42 explosions recorded per day during 2-8 October. 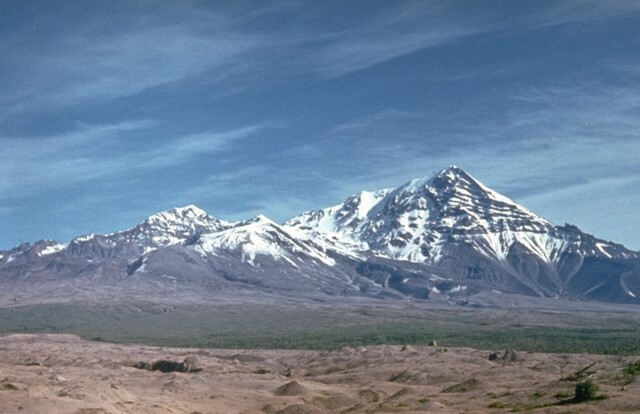 The earthquakes were dominated by long-period events, with fewer numbers of signals indicating emissions and hybrid events. Gas-and-ash plumes rose 3.5 km above the crater rim and drifted no more than 40 km N, NW, and W. The MIROVA system detected 10 thermal anomalies. 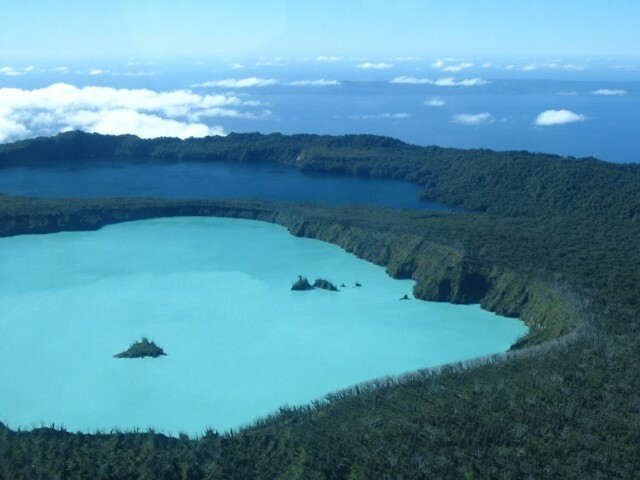 The report warned the public not to approach the crater within a 12-km radius. 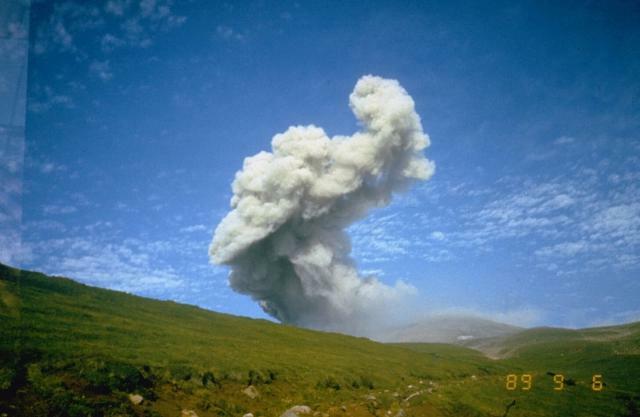 In a special report from 4 October IG stated that the current eruption at Sangay which began on 20 July continued, and that the activity had not changed significantly during the previous two months. 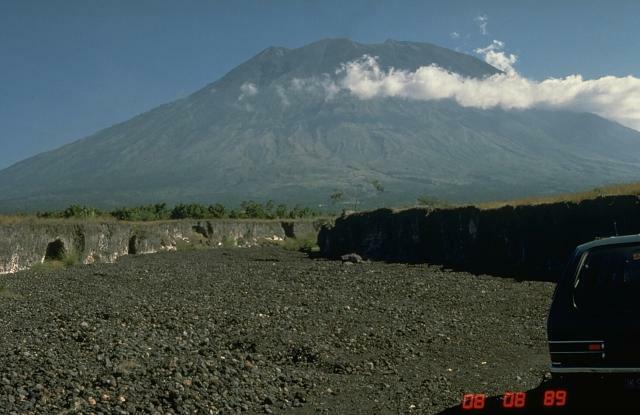 Activity was characterized by explosions at the central vent and lava from the Ñuñurco lava dome flowing down the E and ESE flanks. On each day during the previous week there were about 65 explosions, 25 long-period events, and a few harmonic tremor signals. Ash plumes rose 1 km above the crater rim and caused ashfall in areas to the W and NW (Culebrillas and Licto (35 km NW)). KVERT reported that a thermal anomaly over Sheveluch was identified daily in satellite images on 2 and 5 October. The Aviation Color Code remained at Orange. 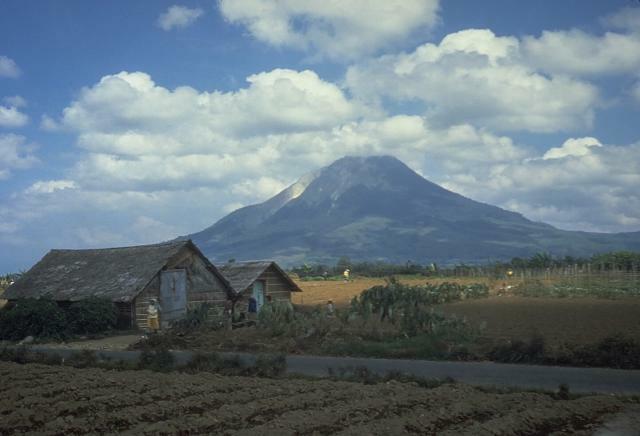 Based on observations by PVMBG and BMKG, webcam and satellite images, and model data, the Darwin VAAC reported that during 4-5 and 7-9 October ash plumes from Sinabung rose 3-5.8 km (10,000-19,000 ft) a.s.l. and drifted in multiple directions. 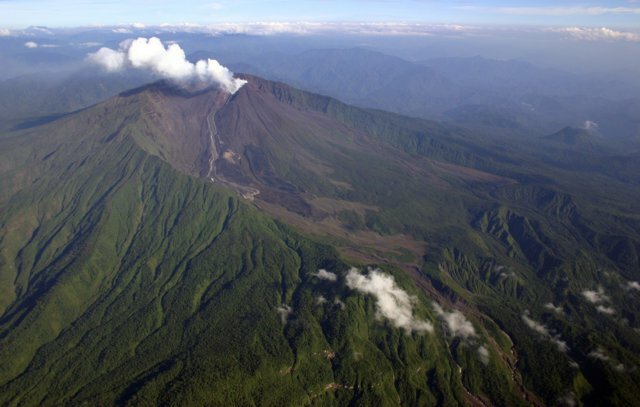 OVSICORI-UNA reported that an event at Turrialba at 0815 on 6 October produced a plume that rose 50 m above the crater rim and drifted NW. An event at 1040 on 9 October generated a plume that rose 200 m and drifted NW.